Al Nasir Nasir al din Mohammad had three reigns. AH 693 to 694 (AD 1294 to 1295), AH 698 to 708 (AD 1299 to 1309) and AH 709 to 741 (AD 1309 to 1340). Date and Mint : uncertain as they did not strike up, but these were struck in the last half of Al Nasir's third reign. Reference : MI 1169 to 1170. Size : 18.4 x 22.0 mm. Weight : 2.18 grams. Grade : The parts of the coin that are visible grade F, but due to having been struck over a pre-existing coin there are major weak areas in the centre. Considerable portions of the underlaying Armenian Takvorian are visible, including many letters in the inscriptions on both sides. 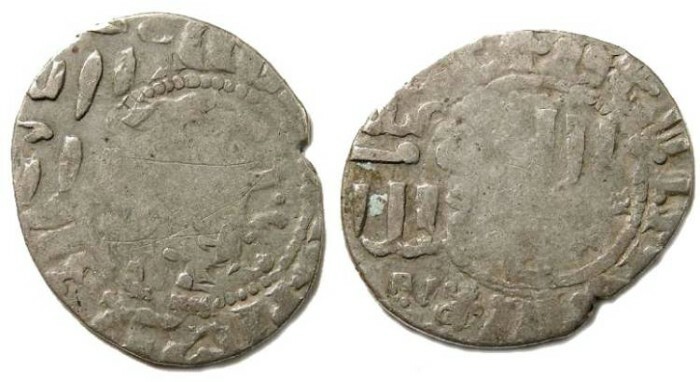 An expert in Armenian coins should be able to work out which Armenian king's coin it was struck over (a good possiblity it will be Levon IV, as he was the contemporary Armenian king who's coins would have been in common circulation at the time).